Carry any portable laptop or tablet in style and disguise. A slim profile tech sleeve is designed to look just like a classic manila envelope. Made from a strong tear-proof material, the envelope is lined with thick grey felt for extra padding and protection. One Tech Document Sleeve, encases up to 15" laptop. Up to three initials can be imprinted on the tech sleeve's folding flap. Enter the personalization details during the checkout phase of the ordering process. Measures 15.4" x 10.4" x 0.6"
Personalized Incognito Tech Sleeve is a hand delivered gift. These gifts are delivered by one of our local design centers located throughout the United States and Canada. Same day delivery is available for most gifts when ordered before the cutoff time. The cutoff time for Personalized Incognito Tech Sleeve is 2 PM in the recipient's time zone. 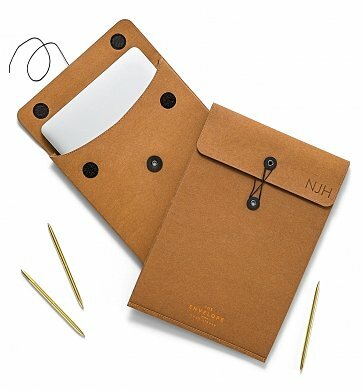 Form meets function in this incognito laptop sleeve, designed to look like a document holder. Felt lined, tear-proof tech sleeve holds up to a 15-inch laptop or tablet. Arrives presentation-ready in a gift box.